Faith: The sun has got his hat on! The sun has shone its little socks off and we have made the most of it! 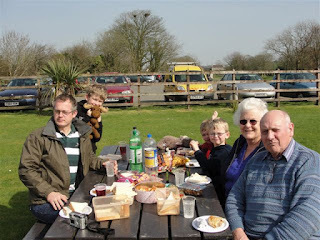 As chicken pox still lingered, biggest's family tea party, became the non-event of the century, so I had a quick re-think and we went for a family picnic with my folks, the only ones willing to mix with us 'unclean' people! Do you know...it was absolutely perfect...good food...good company and teddies too! 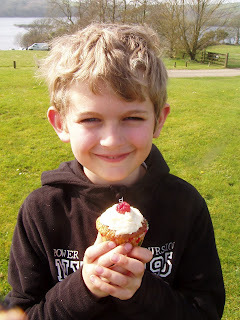 This is the birthday boy who was nine yesterday....he is just about to munch a raspberry trifle cupcake (from 'Cake Days' Humming Bakery recipe book) which disappeared very quickly.... I would highly recommend them! After eating until we were full to the gunnels, we stretched our legs. Sunday was another glorious afternoon so we took the dogs for a walk while the tide was right out. 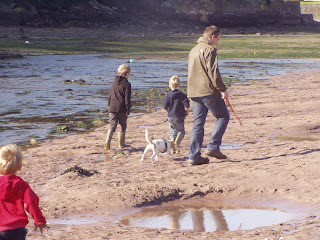 The boys had a whale of a time getting wet and beachy. The dogs bombed about, meeting other walkers and doggy friends......the boys collected shells....as I've already said, we were all truly spoilt. The week has been a busy one as biggest's birthday celebrations seem to have continued (rather like the queen) we have the last birthday 'event' on Saturday night, with bowling and food all round for a handful of boys and girls....I do hope they won't actually be a handful though! Hope you are having a lovely week....and enjoying the sun too! Isn't this weather a joy? It's lovely to see your pictures of you all making the most of it! 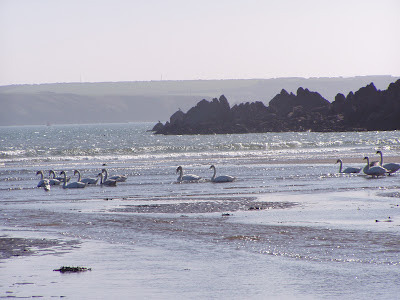 How lovely to live near the sea. How lovely that you managed to have a gorgeous celebration despite the spots! 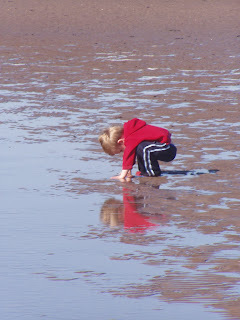 My birthday was a washout that turned out for the best too, sometimes the alternative is better than the original plan. 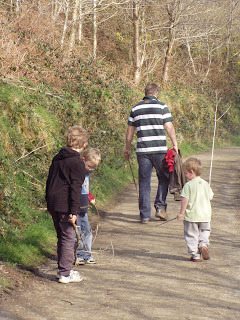 You just can't beat beautiful weather, a family picnic and a walk with sticks! Unfortunately, no sun here. Pouring and more pouring. :( Oh, well. I can enjoy your sun! What kind of swans do you have? They look different than ours, which are Trumpeter swans, I think. Or are they Tundra Swans? Oy. I'm glad most of you are remaining spot free and enjoying the sun! 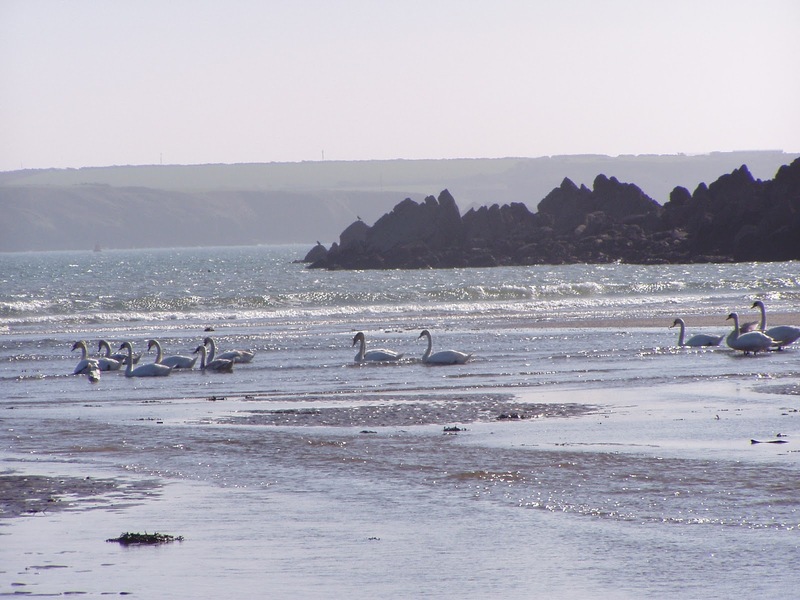 Beautiful swans, and lucky you to have a beach nearby (I think I've said that before). So glad biggest is enjoying his birthday week. Those pesky spots! So glad you got out and enjoyed yourselves in spite of them. Hope the rest of you remain spot free hon! Have a lovely weekend. We had lovely weather too! I enjoyed it so very much. Looks like you had a wonderful time. 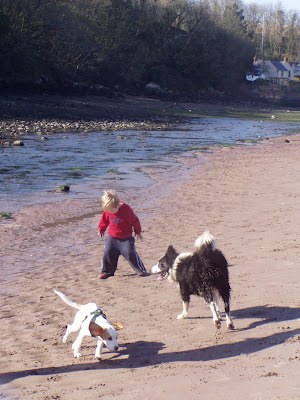 I really like your dogs, Chester is just the cutest dog! Very beautiful pictures. I like all. Very nice picnic with your family. And happy birthday to sweet boy. God bless him.. Happy birthday to your big boy! Looks like you had a lovely day, sunny and summery! Happy Birthday to the birthday boy. 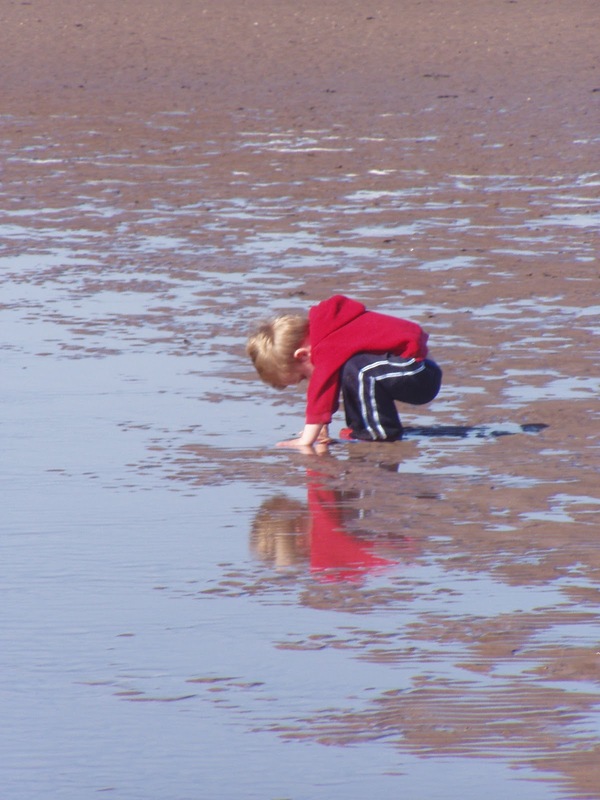 Looks like you really got the best out of the glorious weather despite the chicken pox!